Health Costs > How Much Does a CT (CAT) Scan Cost? How Much Does a CT (CAT) Scan Cost? A CAT scan, also referred to as a CT SCAN, is a noninvasive medical test that will help your doctor diagnose and treat certain medical conditions such as cancer, infections, trauma, musculoskeletal disorders and cardiovascular disease. These scans can also help a physician when performing a biopsy. How much does a CAT scan cost? On average, a CAT scan cost anywhere from $300 to $2,500 depending on the body part being examined, if dye is required and the urgency of the procedure. A lower end scan that doesn’t use a dye is going to cost less than a full scan that includes multiple images and dye. The price is going to rise for each additional body part that is scanned. For example, if you need to have four to six body parts scanned, such as the pelvis, abdomen, and chest, the price can be in the $3,600 to $6,500 range. This would be the price for those who don’t have insurance. Check with your insurance company to see if they will cover a procedure such as this. As long as it’s deemed medically necessary, the insurance company will more than likely cover it. Health.com says $146 is a fair price for a CT to measure calcium deposits in your coronary arteries and $1,418 for a whole-body PET (positron emission tomography) scan with CT imaging. We went ahead and researched a few hospital charges throughout the United States and came up with the costs per body part noted below. The number of body parts that need to be examined can heavily increase the price. If dye or contrast is involved, plan on spending additional money. A CAT scan can be done in two different places. These places include a hospital or outpatient imaging center. Hospitals will generally cost more than an outpatient center. Some areas will have more hospitals than others. Generally, the more hospitals there are, the more competition there will be. A CAT scan will rapidly create pictures of the body allowing the doctors to diagnose problems such as cardiovascular disease, cancer and disorders. If necessary, a dye is used if they want to further enhance the images of the scan. This dye will either be injected with a thin prick or if available, it can be swallowed as well. During the procedure, you may be asked to change into a gown. Once in the facility, the patient will receive a contrast agent that enhances the images of the blood vessels if required, and once the contrasting agent has been admitted, the patient will be asked to lay flat on a scanner bed. Next, the table will move into position so the specific area can be scanned. Depending on how many scans are needed, the machine may pass multiple times. The procedure should take no more than 45 minutes. Once completed, results will come within 24 to 48 hours after a radiologist studies the results. Some hospitals or diagnostic centers include a copy of the films or a CD of the images once the scan has been performed. Prior to a CAT scan procedure, it is ideally required to have a physician check-up in order to get a prescription and prior explanation regarding the procedure and assessment. The use of contrast or dye will also cause you to spend more than the usual CAT scan procedure. During the procedure, the patient may feel nervous or manifest symptoms of claustrophobia that will require the healthcare team to administer medicine for relaxation. IVs and medication can be prescribed, depending on the patient and the circumstances. Hospitals are going to cost more than a local clinic, so be sure to shop around before choosing a hospital. A copy of the film as well as the CD of the MRI are going to more than likely cost extra. Depending on the hospital and/or clinic, this may be included. If the procedure is cancelled within 24 hours, a heavy fee can be applied. Due to the nature of setting of these machines, most hospitals don’t have the choice but to bill you this late fee. A cancellation fee can apply if you were to cancel within 48 hours. Depending on the hospital, this could be as high as $500. Doctors will recommend that you limit your drinking before the CT scan, and it’s also recommended that you watch the sugar intake prior to the scan. Try to leave all metal jewelry at home as this can affect the scan. If any medications are taken, the facility will more than likely want to know about them. Be sure to provide them with a list of all medications taken. When getting a CAT scan, make sure that you know what’s going to be covered. If possible, get everything in writing. When the CAT scan is completed, will it come with additional images? You need to compare the prices of one facility from another in order to get the best possible price for the procedure. Since this is a very common procedure, most hospitals should be able to offer a price over the phone. Highly consider a freestanding facility instead of a hospital as these will be much cheaper. 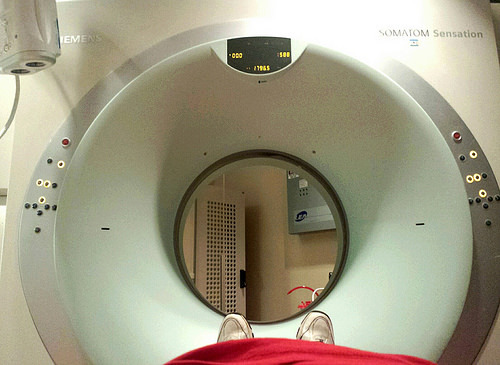 Verify with your insurance company if your chosen facility for the CAT scan procedure is covered. When choosing a provider, always make sure they are in network. Medicare and Medicaid should cover the procedure if deemed medically necessary. For example, Part B will cover diagnostic non-laboratory tests, including CT scans, but the price will vary for those under Part A. Consider paying with cash if you don’t have an insurance policy. Many hospitals will give up to a 70% discount if paying with cash. Some hospitals may be able to setup payment plans for those who can’t pay in full. If you meet certain income restrictions, hospitals may even waive a portion of the bill. Six hours in emergency at West Baptist Hospital in the waiting area for 4.CT scan of abdominal-pelvic w/o contrast less than 10 minutes.This is ridiculous.Previously went to a private place and paid 250.00 for the same scan with contrast.Unbelievable.They were more professional than the hospital itself plus gave me my scans.The hospital nothing. An abdominal cat scan to diagnose a kidney stone. Done in hospital through the ER. No contrast used. This was just the price of the scan. Total ER bill cost me $4200 for 3 1/2 hours.That is $1200/hour. So much for affordable health care. I pay the full shot, because since 2009 my deductible has gone up from $200/yr to $5500/yr. I appreciate the care, but there has to be a better answer. It’s time to repeal Obamacare. CT Scan Head (brain) no contrast paid in cash. $96! at SimonMed Imaging.